Coleoftheball: #Ablogadayforthewholeofmay Day 10 - Stephanie on being a teacher. #Ablogadayforthewholeofmay Day 10 - Stephanie on being a teacher. Today I've got a really interesting post for you it's a little different but I hope you enjoy it. Why am I a teacher? I became a teacher so long ago sometimes the answer can become very foggy. As a child I also played “school” with my teddy bears and dolls. All my family would say “Oh you are going to be a great big sister one day. That day took ages to get there but I never thought much more of my play time choice. As I got older and it was time to start to look for work and decided what I was going to do with the rest of my life I drew a blank. I knew what I did not want to do and the list was long. How would I ever find out what I wanted to do? I thought about it all the time and I tried to find a job thinking that might help me decided. Well with all things they wanted me to have experience before they would hire me but I had never had a job before so it was proving very hard. I never took my spares each year and instead always took classes to fill my days. By the end of grade 12 I was just one credit short of graduating. This meant my OAC year. One second let me back up a minute for the younger readers here. What seems like ages ago there was not just high school up to grade 12. In Ontario we had to do one more year called OAC or grade 13. Don’t ask me what the OAC meant I have no idea. So back to the point now. My last year or OAC year of high school could be a very easy year and I was not required to take any special classes just get that one credit and leave. I chose to take co-op and then a few easy classes my friends had taken the previous year for grade 12. For the co-op I asked what was available. One of the choices was shadowing a teacher in elementary school. I thought that sounded like fun, play with the kids all day and read to them. Then one of the easy classes I took was parenting. Who knew that these two easy choices would shape the rest of my life. The co-op just added one more thing to my list of jobs I don’t want to do. Teaching was great and interacting with the children was fun but it was too much behind a desk for me. Also each year you are told what grade to teach, how to teach it and things can really change too much from there. It seemed boring to me. The parenting class was known as that class everyone had to take the fake baby home that cried. It was so silly walking around with this fake plastic baby and caring for it as if it was real. I got lots of looks those few days. Then at the end of the term we got asked a question. Do you want to do the research assignment or spend four days at the daycare across the street and write a report about your time there? I made the choice faster than a blink. I would spend time at the daycare. I looked at it again as just sometime to play and getting out of classes. I spent my four days there and I feel in love. By the third day I was interviewing. I found what I wanted to do. I wanted to change the future by molding the adults of the future. To this day I love my job and am still working at that same daycare thirteen years later. When things get tough and the paper work piles up or the pay check that comes home is not always enough to pay the bills I wonder why I chose this job. One afternoon after a very hard morning I was doing circle with the children. I was talking about friendship that week and was giving out stars to people had been nice to their peers that morning. After I had found something nice each of them had done I put the marker away and sat back down. One little girl put up her hand and asked “Why don’t you have a star on your hand?” I told her “I am giving out the stars and I did not need one.” She stood up walked over to the markers and took one out and stood in front of me and said “Hold your hand out please? I love it when you take care of us. You are a very nice teacher. You hugged me this morning when I was sad when mommy left. You get a star too.” She then drew a circle on my hand. I was almost in tears. 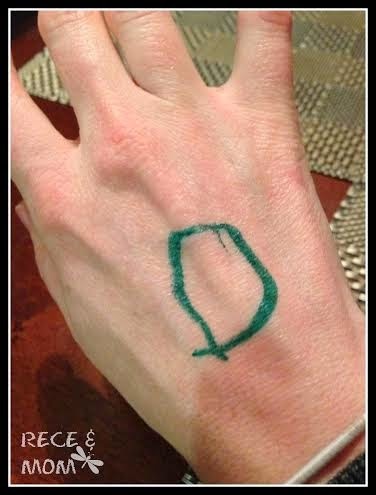 Now every time the pay check is too small or the stress is too high I look at that picture I took of that circle on my hand and remember why I am a teacher. To be there for the kids and care for them. Aw Dude! I take my hat off to teachers, especially of the "Littles". Your Circle Star is super special!